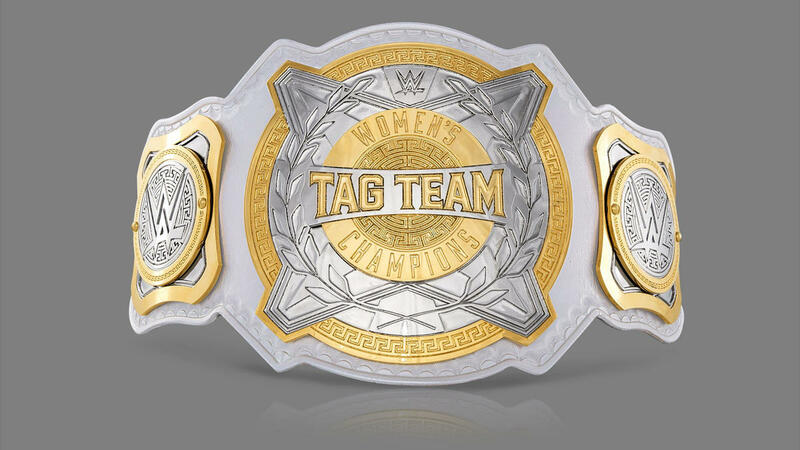 It's officially official: like Santa Vince said on the Christmas episode of RAW, we're getting a Women's Tag Team Championship, and we didn't have to wait long. The new titles will be crowned in an Elimination Chamber match at, uh, Elimination Chamber, and it's going to be a cross-branded championship. Sounds good to us. Alexa Bliss officially debuted the new belts on her segment on RAW, and by God are they majestic. Let's take a closer look at the design, as we always do here. The design on the centerplate is a spin-off of the themes going on on the RAW and SmackDown Tag Team Championships—it's a Greek look that's made even more so by the colorway. The hoplite helmets on the men's tag titles are traded for an emphasis on the laurel wreath instead, and a very Greek etched design in the center, which also appears on the default sideplates. These add a lot of flavor to the belt's overall look. These belts also differ from the male titles with four spokes jutting outward from the centerplate, giving the main strap a slight X shape that makes it look distinct. 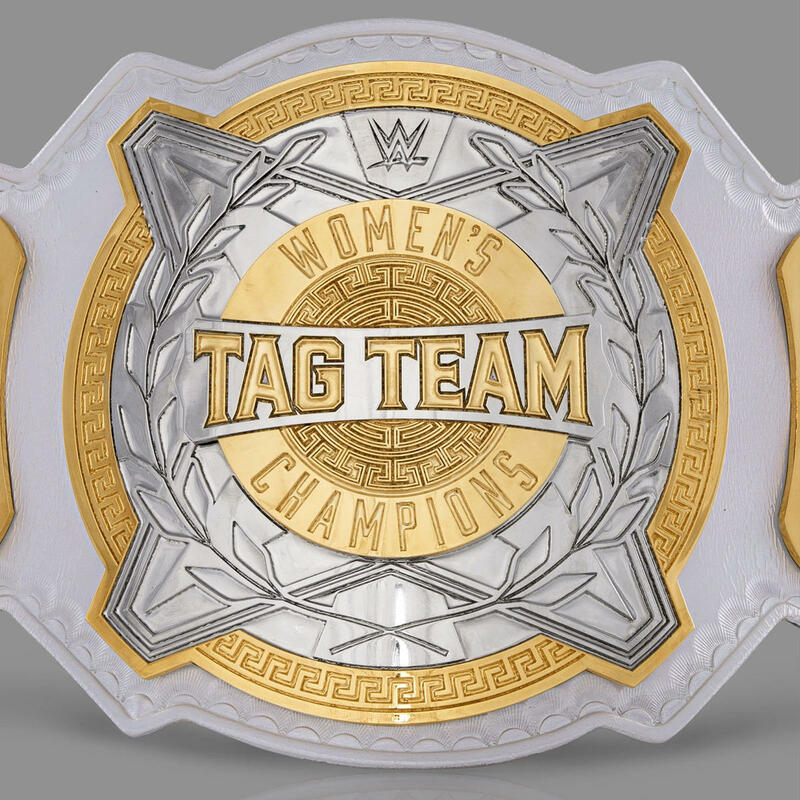 The only thing that knocks off some points from this design, and this is probably a personal choice, is the overemphasis on the words "tag team" in the very center of it all. It just looks and seems weird to really broadcast that this is a tag team championship, which is obvious anyway by the fact that it comes as a pair. 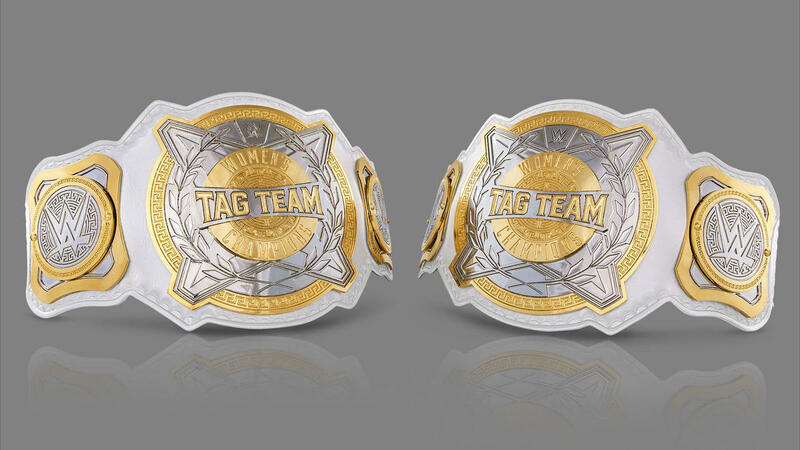 You'll remember that the words "tag team champions" on the males' belts blend right in with the silver centerpiece design, and maybe these titles would be better off with that choice—or at least, the words "tag team" being in silver too. Nevertheless, the WWE Women's Tag Team Championship still looks one hell of a prize to hold proudly above one's head. It's a slam dunk design, but let us know what you think of the new belts! I love WWE . I watch all the championships specially I never miss the game my favorite the great khali. When he enter the ring I support him with loud voice. You can also praise your wrestler in live wwe matches. WWE matches tickets are easily available online.